Upper Wensleydale lies within the Yorkshire Dales National Park and the River Ure runs through the valley from its source at Ure Head on Abbotside Common in the Pennines into the River Ouse at Cuddy Shaw Reach near Linton-on-Ouse, North Yorkshire and Wensleydale is the only dale named after a village rather than its river. Wensleydale is perfect walking country with many way marked footpaths and open landscapes giving spectacular scenery all year round. Wensleydale is also renowned for hill farming, rearing many types of Sheep and cattle and the meadow grass for hay and silage is vital to the system. Its industrial past was water powered mills at Gayle, Hawes, Bainbridge, Askrigg, Thoralby, West Burton and Aysgarth which were variously used to grind corn, produce textiles (wool, cotton, linen, silk and flax), generate electricity or saw wood. Gayle is an attractive small hamlet with Gayle Beck flowing through its center and Gayle Force tumbles over the rocks at the side of the bridge on the road to Hawes. On the other side of the bridge is Gayle Mill a 19th century fully restored operating saw mill which houses the world’s oldest operational water powered turbine and is now a protected building. The mill, an educational attraction, is open to visitors and guided tours on certain days only. Hawes is a picturesque small market town, with the River Ure running though its center. Situated at the head of Wensleydale Hawes is England’s highest market town and along with the dale it is one of the biggest honey-pot tourist attractions of the Yorkshire Dales National Park. Market day is Tuesday attracting many visitors and gives the locals the chance to get together at the auction mart and stock up with provisions at the indoor and outdoor markets. The town has other attractions such as the Dales Countryside Museum and National Park Centre located in the former railway station, a ropemakers where you can see how church bell ropes, halters, skipping ropes and washing lines are made using traditional methods to produce a wide variety of rope products and the Wensleydale Creamery where you can see how the famous Wensleydale cheese is made by hand, to a time-honoured recipe, using milk from local farms where the cows graze the sweet limestone meadows that are rich in wild flowers, herbs and grasses. It is this herbage that gives the milk, and hence the cheese, its special flavour. The cheese has been made in Wensleydale since 1150 when Cistercian monks settled in the dale and established a monastery at Fors just 4 miles away from Hawes. There is also a Pottery and nearby is a children’s playground. Hawes is also a great place for walkers and hikers with many footpaths to choose from including the Pennine Way which is the UK’s first National Trail. Hawes is nestled between the hills of Great Shunner Fell and Lovely Seat to the North and Wether Fell and Dodd Fell to the south. Hardraw Force is a wonderful single 100 foot waterfall dropping from a rocky overhang and is one of the highest unbroken waterfalls in England. The force is situated on Hardraw Beck in Hardraw Scar, a limestone gorge located behind the Green Dragon Inn in the small hamlet of Hardraw. The scar is a natural amphitheater and is the site of an annual brass band entertainment contest. The contest was first held in 1884 and lapsed between 1927 and 1976 and has been held since on the second Sunday in September. Over the last few years two other musical events have taken place here the Hardraw Bash a Folk Rock concert in early July and the Hardraw Gathering which is a three day festival of traditional music at the end of July. 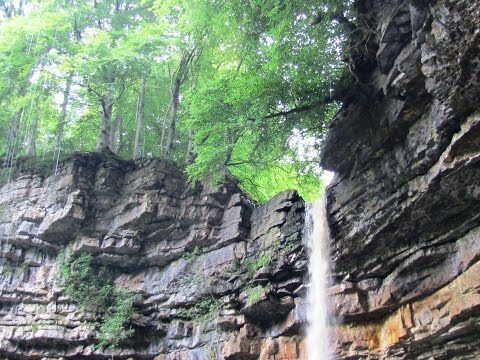 Access to the Hardraw Force and the scar is via the bar of the Green Dragon Inn where an entrance fee of £2 per adult is payable. We park at the side of the road near the institute in Gayle and walk over the bridge and bear right towards Hawes. We pass the Wensleydale Creamery (cheese factory) on the right and walk to the end of the road where we turn left and follow the road round to the right. When the road bends to the right we take the footpath on the left and follow the track up to two gates with yellow arrows we turn right and head across the field to cross a stile. We turn left and follow to the wall through the field. We go through the gate and head forwards still with the wall on our left towards a barn. Before the barn we turn right on the footpath across the field to go over another stile and head forwards to Appersett Viaduct. We go over the stile on the left and turn right through the arches of the viaduct. We head forwards to Appersett and turn left over the bridge. We follow the road to go over a second bridge and follow the road round to the left for a short way. We turn right at the t-junction and the road sign for Hardraw and Askrigg and cross over the stile opposite. We head forwards uphill following the arrows through the fields, going over a stile, some ladders? and another stile until we come to a gate at the top. We now turn right onto the Pennine Way, a track between two walls, and head downhill until we come to the road at Hardraw. We turn left past the Cart House tea room on the left and go over the bridge and past the church on the right to the Green Dragon pub. We enter the pub and take the doorway at the back. We walk forward to the buildings to pay our £2 each to visit Hardraw Force. We follow the path to the force then make our way back to the pub and take the exit on the left. At the road we turn right and just before the bridge we turn left and continue on the Pennine Way, sign posted Hawes 1¼ miles, through the fields, ignoring a path to the right, until we come to the road where we turn right. At the bridge we go through a gap in the wall on the left of the river onto a little path alongside the road. At the end we go through the gate and cross the road and follow the path at the other side. We come to the road again and turn left towards Hawes crossing a bridge with an old loco with carriages on display below in the old station and to the right of the station there is the Dales Museum and the Ropemakers. At the main road we cross over and turn right to pass the post office. We go over the bridge and past the White Hart Inn on the right and the church on the left into the town for a look round. We then head back to the White Hart Inn and take the cobbled footpath opposite and to the left of the church sign posted Gayle ¼ mile. We head forwards between a building and a wall to cross a stile and then follow the stone path over the fields until we come to the road where we turn left and then left over the bridge back into Gayle. This is an easy to moderate walk on minor roads, tracks and through fields with gates and stiles. Approx 5.75 miles allow 2 hours 15 minutes using OS map OL30 Yorkshire Dales Northern and Central areas. Gayle is just south of Hawes in Wensleydale in the Yorkshire Dales. From the A1 take the A684 to Bedale, Leyburn and Hawes. On entering Hawes take the small road on the left for approx ½ mile signposted Gayle. Road side parking in Gayle or there is a car park and road side parking in Hawes. There are public toilets in the Market Place in Hawes near the car park. For refreshments in Hawes there are shops, tearooms, cafes, takeaways and four pubs The Crown, The Fountain and The Old Board Inn in the Market Place and The White Hart Inn in Main Street. At Hardraw there is the Cart House tea room and the Green Dragon Inn.